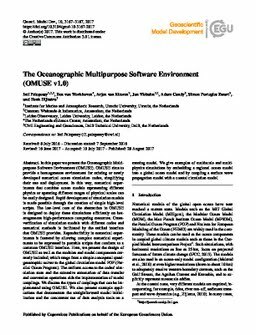 In this paper we present the Oceanographic Multipurpose Software Environment (OMUSE). OMUSE aims to provide a homogeneous environment for existing or newly developed numerical ocean simulation codes, simplifying their use and deployment. In this way, numerical experiments that combine ocean models representing different physics or spanning different ranges of physical scales can be easily designed. Rapid development of simulation models is made possible through the creation of simple high-level scripts. The low-level core of the abstraction in OMUSE is designed to deploy these simulations efficiently on heterogeneous high-performance computing resources. Cross-verification of simulation models with different codes and numerical methods is facilitated by the unified interface that OMUSE provides. Reproducibility in numerical experiments is fostered by allowing complex numerical experiments to be expressed in portable scripts that conform to a common OMUSE interface. Here, we present the design of OMUSE as well as the modules and model components currently included, which range from a simple conceptual quasi-geostrophic solver to the global circulation model POP (Parallel Ocean Program). The uniform access to the codes' simulation state and the extensive automation of data transfer and conversion operations aids the implementation of model couplings. We discuss the types of couplings that can be implemented using OMUSE. We also present example applications that demonstrate the straightforward model initialization and the concurrent use of data analysis tools on a running model. We give examples of multiscale and multiphysics simulations by embedding a regional ocean model into a global ocean model and by coupling a surface wave propagation model with a coastal circulation model.